After the Washington Redskins were eliminated from the NFL playoffs thanks to a 35-18 loss to the Green Bay Packers on Sunday, controversial Christian quarterback Robert Griffin III cleaned out his locker at Redskins Park, likely for the last time, on Monday and left behind a farewell note for the team. Although Griffin's career with the Redskins got off to a hot start as he led Washington to the playoffs and an NFC East division championship in 2012, injuries and poor pocket play led to Griffin being benched and replaced with fellow Christian quarterback Kirk Cousins, who started every game for the Redskins in the 2015 season and broke a number of the franchise's single-season passing records. As the Redskins are expected to release Griffin in the upcoming offseason and attempt to resign Cousins, whose contract is expiring this offseason, Griffin showed up Monday to clean out his locker at the Redskins' training facility in Ashburn, Virginia, in what is is likely his last appearance with the team. "People are often unreasonable, irrational, and self-centered — forgive them anyway. If you are kind, people may accuse you of selfish, ulterior motives — be kind anyway. If you are successful, you will win some unfaithful friends and some genuine enemies — succeed anyway. If you are honest and sincere, people may deceive you — be honest and sincere anyway. What you spent years creating others could destroy overnight — create anyway. If you find serenity and happiness, some may be jealous — be happy anyway. The good you do today, will often be forgotten — do good anyway. Give the best you have and it will never be enough — give your best anyway. In the final analysis, it's between you and God. It was never between you and them anyway." Griffin's note sparked a social media firestorm with many critics wondering if this was Griffin's way of blaming his misfortunes on the organization. However, one of his Redskins teammates, linebacker Keenan Robinson, found the note to be a sign of Griffin's maturity. 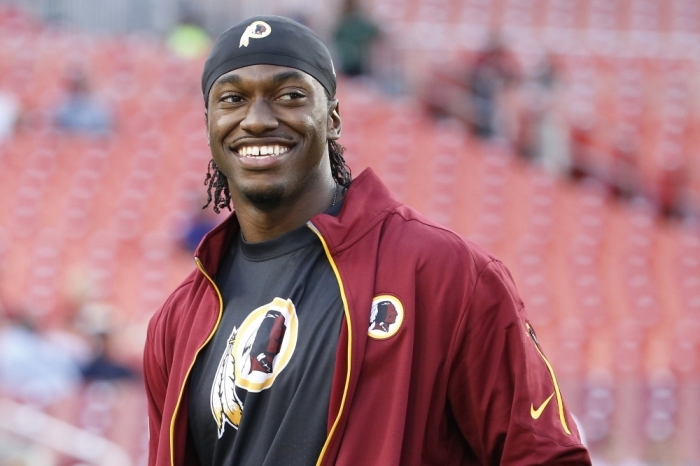 "1 of many reasons @RGIII's career is far from over," Robinson tweeted, along with a photo of the note. "He handled his situation with professionalism and class #Respect." Some have claimed that the actual wording of Griffin's message is an age-old saying that can be attributed to Mother Theresa. However, QuoteInvestigator.com argues that the saying was first coined by Kent M. Keith, an American writer and higher education leader.